The Golden Hum is a bittersweet album, one that has all the promises of a commercial success. It has slick production, the right amount of hooks, isn't too loud, and isn't too quite. It moves along with power, taking chances, but also playing it safe, with a confident, cool touch. The songs are well written and strong enough to grab audiences on a mass level. Most importantly, the singer can convey emotion in his voice, but not to the point of annoyance. He gets the message across, let's his feelings show, and still manages to make his voice clear and calm, perfect for radio loving kids everywhere. However, The Golden Hum also seems to be the kind of album that slips through the cracks. With tight, melodic songs, rooted in rock, but centered around swirling pop, it seems a bit too innovative, too unordinary for the mass population to really latch on to. They want simple pop hooks, whereas here Remy Zero delivers complexity with their honesty. 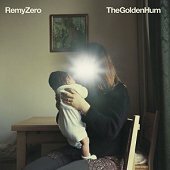 And where they want easily digestible songs that go in one ear and out the other, leaving you singing along to something that has no meaning to you, Remy Zero seems to want you to listen deeply and attentively. They want you to understand what they're singing so you can walk away with your own meaning to each song.